Be sure to enjoy recreational amenities, including a health club, an outdoor pool, and a spa tub. Additional amenities at this hotel include complimentary wireless Internet access, a television in a common area, and tour/ticket assistance. Located in Valldemossa, Mirabó de Valldemossa is in the mountains, within a 15-minute drive of Real Cartuja de Valldemossa and University of the Balearic Islands. This 4-star hotel is 12.1 mi (19.5 km) from Cathedral of Santa Maria of Palma and 10.2 mi (16.5 km) from Iberostar Stadium. This enchanting hotel reflects a new concept of accommodation which is sure to impress and delight even the most discerning travellers. It is situated in the heart of Valldemossa, a charming and picturesque town situated in the Tramuntana mountain range (a World Heritage Site). Moreover, the beautiful Palma de Mallorca and all its attractions are just a 15-minute driving distance away. This welcoming property boasts a choice of spacious, light-filled rooms specially designed for guests to feel right at home. Each features its own character and come equipped with a host of excellent services and facilities. All the rooms come with an en suite bathroom, as well as TV, heating, telephone and Wi-Fi connection. 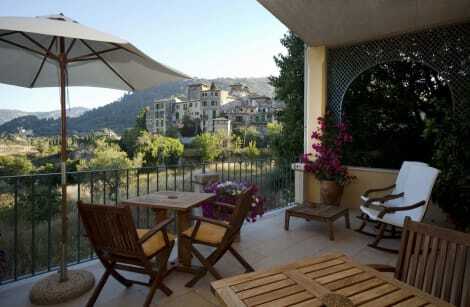 Moreover, they also boast stunning views over Valldemossa and the surrounding mountains. Certain areas of the hotel also offer guests the chance to admire Majorca's rich and varied landscape with glimpses of the magnificent Palma bay. Located in Valldemossa, Rusticae Es Petit Hotel de Valldemossa is in the historical district, within a 15-minute drive of Real Cartuja de Valldemossa and Son Marriog. This hotel is 12.2 mi (19.7 km) from Cathedral of Santa Maria of Palma and 10.4 mi (16.7 km) from Iberostar Stadium. lastminute.com has a fantastic range of hotels in Valldemossa, with everything from cheap hotels to luxurious five star accommodation available. We like to live up to our last minute name so remember you can book any one of our excellent Valldemossa hotels up until midnight and stay the same night.